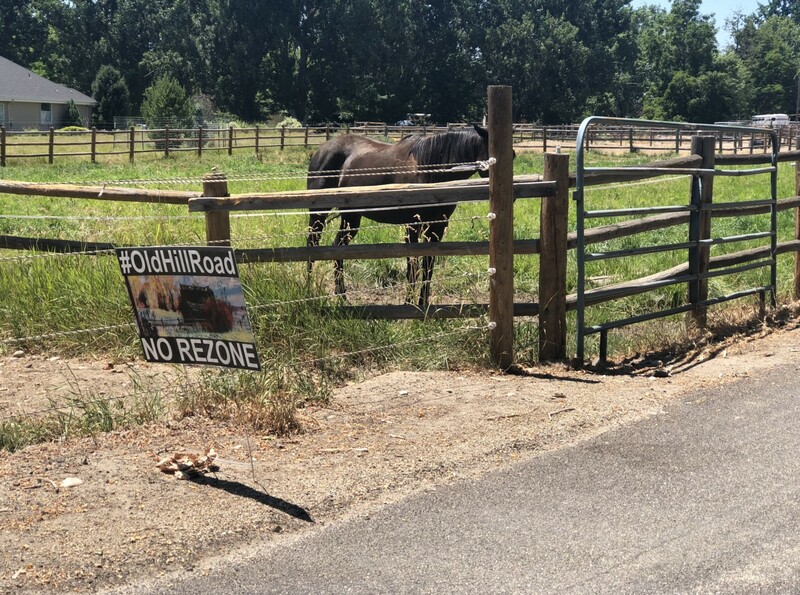 Neighbors in NW Boise are concerned about pending development in the area - with many posting "NO REZONE signs" along the road. The battle for the future of Northwest Boise is about to heat up again in Boise’s city hall and Garden City’s ACHD HQ. WHPacific submitted a new application in March for its Prominence development, with a raft of changes from the 2018 version. The project is located along Hill Rd.at Bogart Ln. Developers asked for rezoning, subdivision and annexation for a portion of the project not currently in city limits. 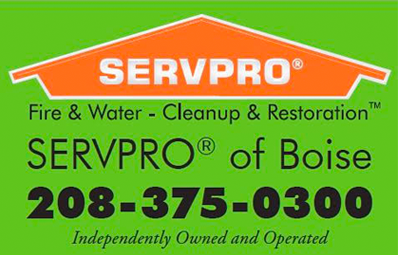 The project’s owners are listed as Stanley Matlock, as well as Viper Investments According to State of Idaho records, Viper is controlled by local homebuilder Corey Barton. Left intact is a development that developers concede will add trips to the already overburdened road network in the area. And, neighbors fear, change the character of the area. 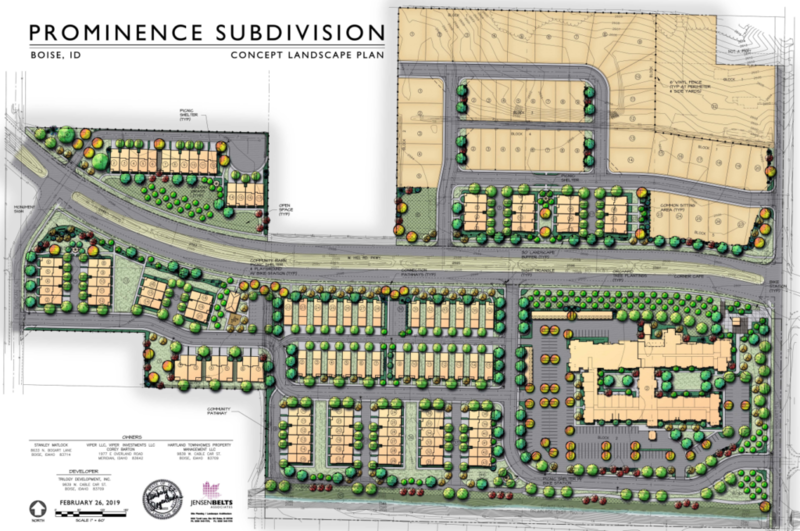 Updated 2019 site plan for Prominence Subdivision in NW Boise, Via Jensen Belts Associates. In an extensive 15-page letter to the City of Boise, developer Jane Suggs outlines the changes made to the project and why it should meet with City of Boise approval. (Note the letter is dated February 26, 2018 – but a city staffer confirms this is an error and the letter is from February 2019). Last year, WHPacific proposed a total of 307 homes on the 38.39 acre property. The updated plan cuts this to 286, a decrease of about 6.8%. They changed the mix, slightly increasing the number of apartments from 120 to 130. The new plan decreased the total number of single-family homes from 187 to 156 – down 16.5%. Here’s how the new and prior plans break down. Part of the project is a future, proposed “active senior living” complex comprising the 130 units. Suggs says the project would be targeted to folks 55+ and would likely provide a number of amenities. It would include what Suggs called “ample parking,” with at least 1.4 spaces per unit. The apartments would also include bike parking and storage. The applications left the apartment project for a future, separate, conditional use permit application. WHPacific held a neighborhood meeting in early February that it emphasized to City of Boise officials was not required. More than 45 people signed an attendance sheet for February’s meeting. Suggs told city planners the project generated continued neighborhood concerns over density, traffic, schools, open space and wildlife. The previous project plan generated significant neighborhood comment – with 165 pages of comments filed with the City of Boise. WHPacific said it hoped the latest neighborhood meeting would show some of the changes it made in response to the prior feedback. Suggs’ letter to the City of Boise specifically notes the letter rolls in feedback from public agencies. The developer addressed concerns it says it heard over affordable housing the mix of homes previously planned. Essentially, problems already exist with traffic, but the development doesn’t tip anything into further problem status, instead, adding to the challenges already felt. “(B)oth intersections at Duncan Lane/State Street and Bogart Lane/State Street exceed operational thresholds in 2025, even if the development is not built,” Suggs wrote (emphasis in original). The project likely faces hearings from the Ada County Highway District, as well as working through the City of Boise’s process. Boise staffers let Suggs know that the project would “need extended review,” and the public hearing process wouldn’t start until May. The meeting in front of Boise’s Planning & Zoning Commission is set for May 13 at 6pm at Boise City Hall.